The Masdoris fishing vessel has been developed with the help of Marc Van Peteghem, famous naval architect (www.vplp.com), based on actual traditional wooden fishing vessels. While visiting the Bengal Delta and following discussions with fishermen, observation of boat characteristics, sea and river trials, Marc and Yves re-visited the design of this typical fishing vessel. 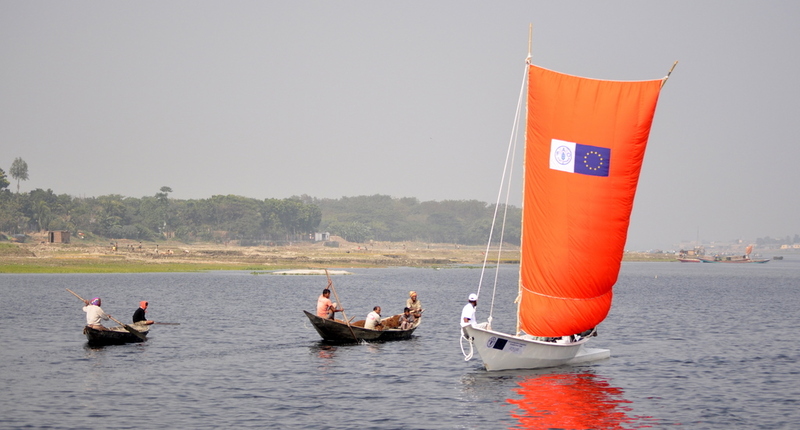 The Masdoris is the first answer of TaraTari Research and Development on Bangladeshi fishermen issues. In fibre composite it complies international standards and is safe and secure either in rivers and sea areas. Unsinkable and resistant, its components are making it to last more than 20 years with minimal maintenance. TaraTari Shipyard already sold 31 units of this boat. 25 Masdoris were sold to the FAO Bangladesh and 6 to the NGO Friendship. All were given to Bangladeshi fishermen, and first accounts from them are positive.